After a five-day sentencing trial, David Risner, a former police officer, was sentenced on Wednesday to life in prison without the possibility of parole in the shooting death of Little River-Academy Police Chief Lee Dixon. 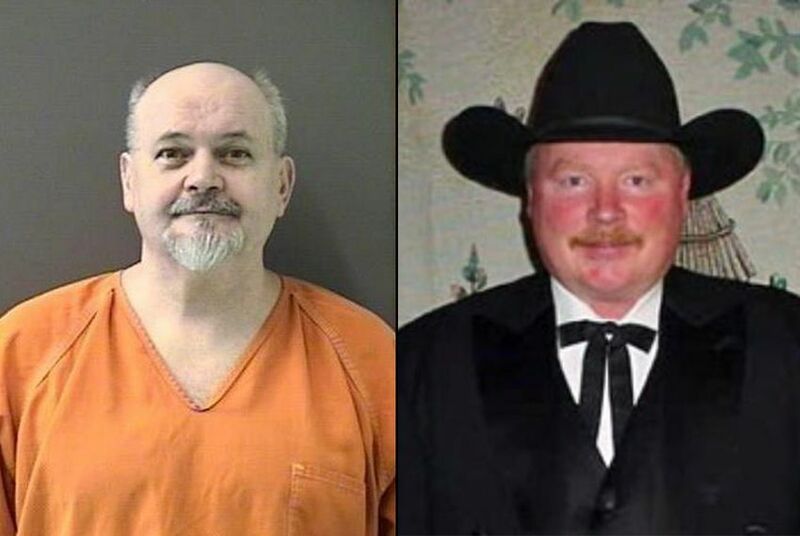 BELTON – The killer of a small-town Texas police chief escaped the death penalty on Wednesday after a jury could not reach agreement on his punishment. David Risner, a 59-year-old former police officer, was automatically sentenced to life without the possibility of parole. He was convicted last Monday in the 2014 shooting death of Little River-Academy Police Chief Lee Dixon. After hearing testimony for five days in the sentencing phase of Risner's trial, a Bell County jury deliberated for more than four hours before announcing it could not agree to sentence Risner to death. Almost two years ago, on June 19, 2014, Dixon arrived at Risner’s house a little after 5 p.m. to investigate a complaint. The two talked for a few minutes, but when Dixon went to cite Risner for a class C misdemeanor, things escalated. A gunshot sounded, and the shouting ceased. Another shot rang out a few seconds later. Risner called 911 himself, and a sheriff’s deputy arrived to find Dixon dead on the front porch, according to an arrest affidavit. In court, prosecutors showed an autopsy photo of Dixon, missing almost half of his face. In the 1990s and early 2000s, Risner served as a law enforcement officer in several departments east of Dallas. He was active in his church and described as a generous man. Later, he took a contract job in Baghdad during wartime. Both prosecutors and defense attorneys agreed that Risner suffered from post-traumatic stress disorder and a traumatic brain injury. Multiple explosions rocked the compound where he worked as a security supervisor in Iraq, at least once blowing out the windows of his room. The defense argued those disorders were the cause of the shooting, and because of that, Risner shouldn’t receive the death penalty. Prosecutors said Risner couldn’t use PTSD or a brain injury as an excuse because millions of people are affected by these conditions. Even with the lesser sentence, Risner will still die in prison, Hunt said. He only asked that his client be spared from execution. Throughout the day Wednesday, David Risner smiled broadly at his wife and son in the courtroom and wiped tears from his eyes during discussion of his friends and family. When talk focused on Dixon, his face became still and unreadable. Mary Dixon cried quietly and often. Several times, she left the room in tears. “How bad do you think Mary Dixon wants Lee?” Barnes asked on cross-examination. In his closing argument, he held Mary’s hand as she sobbed and turned the jury. “She would walk [Risner] out of this courtroom for just five minutes with Lee,” he said. In a death penalty sentencing, jurors must unanimously agree that the defendant will pose a future danger to society and that nothing in the defendant’s background or character warrants the lesser sentence. The defense pointed to a doctor’s evaluation of Risner that said he was low-risk for future danger. Prosecutors said his multiple altercations with Bell County jail staff show that isn’t the case. Since his arrest almost two years ago, Risner has been in altercations with jail staff over his medication and his laundry, defense attorney Jeff Parker said. He said jail staff was able to handle it easily both times, indicating the prison system would be able to control Risner. The prosecutors have also pointed to Risner’s several run-ins with law enforcement before Dixon’s death but after Iraq as evidence that he should receive the harshest punishment. He fired a shot above an officer’s head in one incident and told a dispatcher he would kill the officer if he ever returned to his home. Years later, he became argumentative with an officer after a traffic stop, and officers found a rifle in his trunk. The defense focused on Risner’s behavior before Iraq to justify a life sentence. Hunt pointed to several examples where Risner gave money or even the title to his truck to strangers in need, and the Risners created a Sunday school program at their community church. In 1992, he was named officer of the year for the Van Zandt County Sheriff’s Department. The last death penalty trial in Bell County was in 2007, when Richard Tabler was sent to death row, Barnes said. There have been three death sentences in Texas this year.